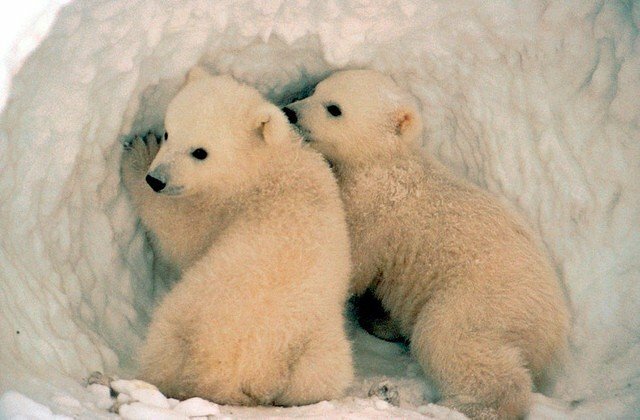 Scientists in Russia are developing a way to use grizzly bears as surrogate mothers for polar bear cubs, in the hopes of preserving the country's endangered polar bear population. "A group of researchers involved in the experiment is currently busy with hard preparatory work," Nikita Melnikov, a member of the research group in Ekaterinburg, an industrial city in the Urals, told Uralinform.ru [translated by Russia Today]. "A sperm bank with white bears eggs is now being created. Animals that will take part in the embryo transplantation are being determined. We're negotiating with different Russian zoos," he said. Scientists have already carried out preliminary experiments, which have shown that the grizzly bear can become a surrogate mother. Artificial insemination was performed on the grizzly surrogate, after which she successfully gave birth to a healthy cub. This wouldn't be the first instance of polar-grizzly interactions -- hybrids called pizzlies or grolar bears have been spotted both in the wild and in captivity. Scientists have already carried out preliminary experiments, which have shown that the grizzly bear can become a surrogate mother. Artificial insemination was performed on the grizzly surrogate, after which she successfully gave birth to a healthy cub. The bears are the result of a polar bear and grizzly bear mating -- though this is very different from the proposed surrogacy, which would produce pure polar bear cubs and not a mix of the two species.